The Video DJ Toolkit is a massive library of video clips designed for the professional mobile DJ. 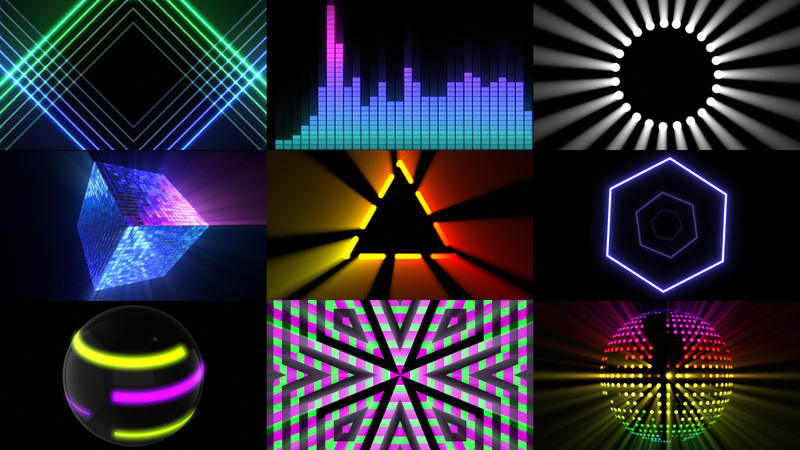 This volume contains 100 clips designed to make your screens become a part of your light show. Most of the clips in this volume also include a drum track allowing the visuals to be sync’d to music in DJ software such as VirtualDJ. See the gallery images for full contents. Kaleidoscope, Spectrum Analysers, Wipes, Lightbox, Disco Spheres, Plasma, Gobos, Mirrorball. See images below for a guide to what is in each category. There are also compilation videos – one containing all 100 clips in a random order, and a compilation for all the clips in each category. PLEASE NOTE:These clips are designed to be used with video DJ software (such as VirtualDJ) which can use the drum track on the clips to synchronise them with the music that you’re playing. (Without such software you would still be able to play the videos, but they wouldn’t be synchronised to your music).